Russian project Erthad, originating from Kazan, exists since late 90-ies, but until now still hasn't made any official releases and preferred to stay in underground, recording music only for himself and his friends. We have been endeavouring to change this situation for a long time and now we're glad to present this wonderful disk to your attention. "Gma" was recorded in 2002 with the use of voice and software noise synthesizers. If one says that the album's style is called "ambient noise" - is to say almost nothing. The disk has very specific atmosphere: this is a noise meditation, calm and detached from emotional fuss. An intuitive electronic pulse synchronizes with brain frequencies, rising and falling waves of non-aggressive white noise pacify thoughts, and constantly rustling high frequencies when listened to attentively evoke dissotiative sensation, dissolving perception in the sonic field. However, everything as always depends on a listener himself. [...] Dit werkje, slechts in een oplage van 250 stuks uitgebracht, is voortgebracht door Erthad, een Russisch project wat al sinds de jaren '90 bezig zou zijn maar tot nu toe nog niets officieel heeft uitgebracht. Gma is ergens in 2002 opgenomen en nu dan verkrijgbaar. Wat te verwachten? Ambient / noise, verdeelt over zes nummers en ongeveer 41 minuten. Minimalistische, ruisende soundscapes. Vooral nummers een en drie werken hypnotiserend, het geluid is... ik kan geen beter woord verzinnen dan "gigantisch", het voelt ontzetten diep en groot aan en maakt voor heel fijne ruis die je het beste op luid volume kunt luisteren op de koptelefoon. Op nummmers 4 en 6 wordt met primitieve ritmes en stemgeluid geexperimenteerd en ik vind deze nummers dan ook wat minder boeiend. Kort door de bocht, als deze persoon verder gaat op het ambient / drone / soundscape pad, ben ik erg benieuwd wat er uit komt. Voor diegen die warm worden van binnen bij namen als Stratvm Terror en Moljebka Pvlse. Erthad is een Russisch project dat al een hele tijd bezig is (sinds eind jaren 90 van de vorige eeuw). Het koos er zelf voor om geen officiele releases uit te brengen en in de underground te blijven. Na veel vragen is het Zhelozobeton gelukt om ze dan toch een schijfje uit te laten brengen. Gelimiteerd tot 250 stuks op cd-r.
Het betreft opnamen uit 2002, een ruime 40 minuten, verdeeld over zes ongetitelde stukken. Zes stukken van ambient noise, want dat is waar deze muziek het best ondergebracht kan worden. Minimalistisch in opzet, maar wel zodanig dat het goed spannend blijft. Weer eens echte koptelefoonmuziek, waar de donkere achtergrond goed wordt aangevuld door het hoog dat door blijft trillen. Een waar frequentiespel kortom, eentje waaraan goed te horen is dat Erthad al langere tijd actief is en zijn software goed onder controle heeft. Volgens de labelinformatie over deze release wordt er ook gebruik gemaakt van de stem, maar die is dan dusdanig vervormt dat hij bepaalt geen hoofdrol speelt. Daar waar hij ingezet wordt levert hij een bijdrage aan de experimentaliteit van dit plaatje wellicht, soms positief, soms ook licht irriterend. Daar waar ik me de eerste keer sterk liet overdonderen door Erthad was het de tweede luisterbeurt ineens het gevoel dat het allemaal wel heel minimalistisch was. Toch na meerdere luisterbeurten, ja dit is een meesterwerkje. Laten we hopen dat de reacties op dit schijfje Erthad er toe kunnen verleiden om binnenkort nog meer werk uit te brengen. Active since the late 90's but without any official releases until now, Erthad's first output on physical format is the sort of obscure discovery from the Russian scene that makes Zhelezobeton a reliable source for new releases that go beyond what's already established or tamed by familiarity. Recorded in 2002 using processed voices and software synthesizers, "Gma" compiles 6 tracks of serene yet expansive robotic meditations, at times approaching some form of mantras for nano-technological organisms. Soothing but not ambient in nature, the closest comparison I can think of would be another Zhelezobeton act (Degeneral) crossed over with Sshe Retina Stimulants, but that's still not close enough to what can be found here. Erthad are industrial, plain and simple. That doesn’t mean that the album isn’t interesting or worth listening too, far from it, but Gma is a no frills approach to the genre. Don’t let the odd and somewhat out of place cover art fool you, Erthad construct solid industrial music worthy of attention. Gma is comprised of six songs totalling 41 minutes. 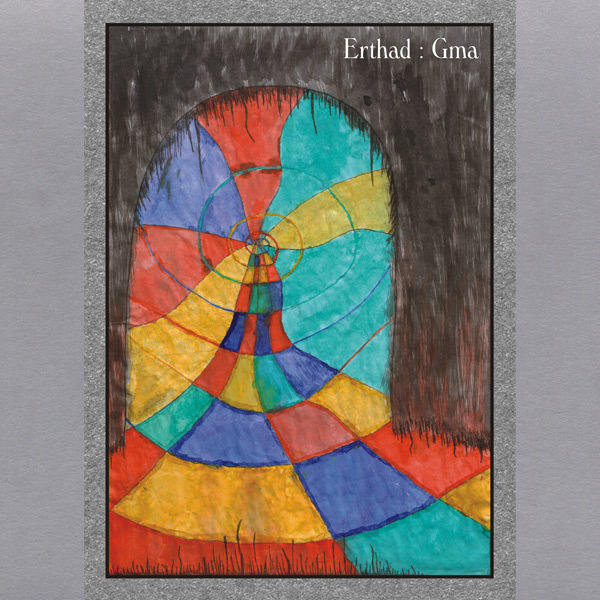 Erthad have done an excellent job of maintaining a consistent feel throughout, making Gma flow very nicely. Gma transports the listener aboard a strange vessel, on an unknown planet deep into uncharted space. You are in the colony of a strange, insect-like race of creatures alien to you. Walking about the ship, you hear its heartbeat, the static buzzing and humming; the pulse of unknown life resonating in chasms so deep the bottom is unfathomable. You feel the alien presence all around you, watching you, monitoring you, and tracking your movements. In the distance you hear their cries, their distorted obscure language calling you to them. You travel deeper into the ship, moving towards the center, closer and closer to your strange host. Their cries become increasingly louder as you reach the heart of the ship and come face to face with these obscure beings. They take hold of you, their touch chilling your body. You scream out but nobody is around to help you. Slowly passing into unconsciousness amidst their cries, your journey ends. The picture on the cover of "Gma" reminds you of a psychedelic staircase leading you through a darkened gate into the void. The reverse side shows you a drawing from two eyes with teeth (yes, it sounds as weird as it is). The disc itself - a CD-R in an edition of 250 copies - has been blessed by a drawing in the same atmosphere and it looks like all copies were drawn separately. Even though it looks minimal, you can see on the package alone that this release was made with a lot of love and affection. When you play the album, the music quite fast grasps you by your throat and gives you an uneasy feeling which lasts up onto somewhere in the midst of the third (untitled) track. From that moment on you surrender to the feeling and you experience a certain beauty in its oppressive atmosphere. Erthad from Kazan delivers an album filled with drones and ambience made from noise generators and according to the release-info, the human voice. Even though the voice isn't recognisable as such, it doesn't surprise me. In the current day and age you can go a long way with software manipulations and certain noise structures - well - they sound like they could be voices. Six untitled tracks can be found on 'Gma' and there are no bad moments. As stated earlier, there is a turning point during the third track, probably caused by getting acquainted to the sound and surrendering to the emotions in the recordings. This atmosphere is prolonged towards track 4 and 5, while the last track turns out to be slightly rhythmic in nature. Okay, maybe not rhythmic, more like repetitive. I'm already looking forward for that "difficult second release" and I can only hope it doesn't take another 5 years, this is quality that deserves to be heard. Zhelezobeton has proven their knowledge about good music before with releases from Grismannen, The Infant Cycle and Cataclyst, and with a sales price of 6,50 euro for this gem, you have to have a good reason not to be at least a little bit interested. Bauke van der Waal, Connexion Bizarre. One of the reasons for not doing spoken announcements in our podcast are the tongue twisting names of artists and labels. Erthad might be doable, but the name of the label Zhelezobeton is certainly less easy. Erthad is originally from Kazam and started out in the late 90s, but it's not until now that he made his first release on this for me new label. 'GMA' was already recorded in 2002, using 'voice and software noise synthesizers' as it says on the website (the cover holds no information). Very occasionally it's a bit of rhythm, but the major part of the music are built of long sustaining sounds, that are not loud enough to be real noise, but at the same it's not ambient enough to be called erm ambient. It's music that sort of falls between these categories and that's of course not something new. It's not always 'deep' but rather stays on the surface of things and one wish they had gotten some more out of it. Worn out I got home from work as I put Gma by Erthad into my CD player and lay myself on the coach to relax. When I closed my eyes I felt like going unconsciousness as a dazzling of bright coloured pulsating frequencies appeared in front of my eyes and peaceful I sank deep into a blanket of whitenoise encapsulating my being in softness. 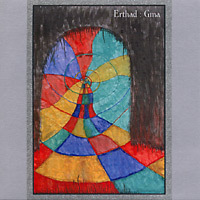 The music of Erthad is minimal in structure but there is a lot happening beneath the surface that takes you away on journeys beyond infinity. Musical Erthad is to compare with German industrial legend Maeror Tri except for the fact that Erthad use digital equipment instead of analogue. Erthad is making music for a few years already but never wanted to do a serious release only for friends and those who are interested. Fortunately Zhelezobeton knew to persuade him to do an international release and we should be thankful for this. Gma is an interesting release with interesting music; freely you can let yourself fall in this ocean of drones and whitenoise. The music is a colourful vertigo just as on the beautiful cover is demonstrated. After taking a look at the website of Zhelezobeton I can say the label has much attention for the artwork as all releases looked precious works of art. Gma contains six untitled tracks various of character and approach. It has a lot of noise but it never sounds aggressive or harsh. The sound is subtle modulated in dreamscape kind of soundscapes designed with refinement. The monotonous compositions stay tensed and change just in time to take you deeper away into this bright cosmos. These pulsating frequencies give a massage to the brain as subliminal sound waves get their way to your sub consciousness to stimulate the senses and refreshing your mind. With only 40 minutes this seems a short CD in times that most CD’s take their maximal time but I think this is just OK for this is quality above quantity. A very enigmatic and mesmerizing release by this promising Russian label from whom I hope to hear more in the future. This is the first full release I have the pleasure to review from this Russian project, and believe me; they have done a very nice job with this album. The art is minimal but having a complex concept behind it. a psychedelic colorful spiral becoming a gate to its own center, it’s just like an entrance to another dimension which could be explored when hearing the experimental dark ambient noise hallucinations and sounds through the whole 10 tracks developed here. the most interesting element from this release is the ritualistic atmosphere and the dark environment mixed in an allegoric way, complementing perfectly each other and giving you enough bases, to enter in a state of anxiety,coz EARTHAD’s music is so abrasive and suddenly you are submerged in a dense, ethereal trip to unknown dimensions. Another aspect to consider here is that each track has an own identity and specific sound going according each other. Itґs just a connection between 10 dimensions which one by one is revealed to you through sounds and expressions with a high context in the whole sense of the word.